The barren desert that is gaming on Android has been with us for as long as the platform itself, and it appears that it is only now changing, with the release of games like Angry Bird and Fruit Ninja. The newly released MiniSquadron looks to be another one of those games that attempt to bring the quality level up to that of iOS, featuring OpenFeint alongside some of the most addictive gameplay I've ever seen from an Android game. However, it is a port of an iPhone game, and we all know how well that's gone historically. Will MiniSquadron break this trend? Or will it end up being just another dud in a series of failures? Read on. MiniSquadron, being a 2D game, has relatively simple, Nintendo style graphics reminiscent of the games we were all playing in the 1990s. If you want a 3D aerial combat game, you should look elsewhere (for example, Winds of Steel). For the gameplay MiniSquadron aims for, without all the complicated moves in 3D space, the graphics are perfect. The soundtrack of MiniSquadron is another sticky point - some people will love it, some people will hate it. A shooting game like this would be much better served with a plate of fast, upbeat music, but what you will find in MiniSquadron is a mix of chilled out Mozart and Beethoven. Then again, if you don't like it, you can always turn the volume off. 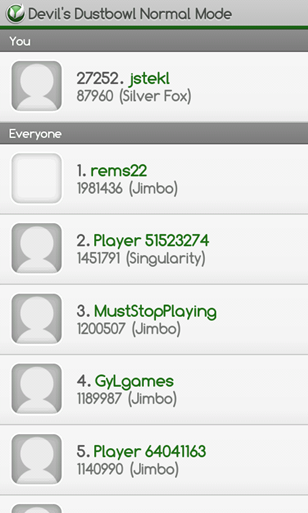 The controls of a game are often what make or break it - just take a look at the widespread appeal of Rolando for iOS vs. the incognito state that Dynamite Pro Football 2010 for our beloved Android platform is in. 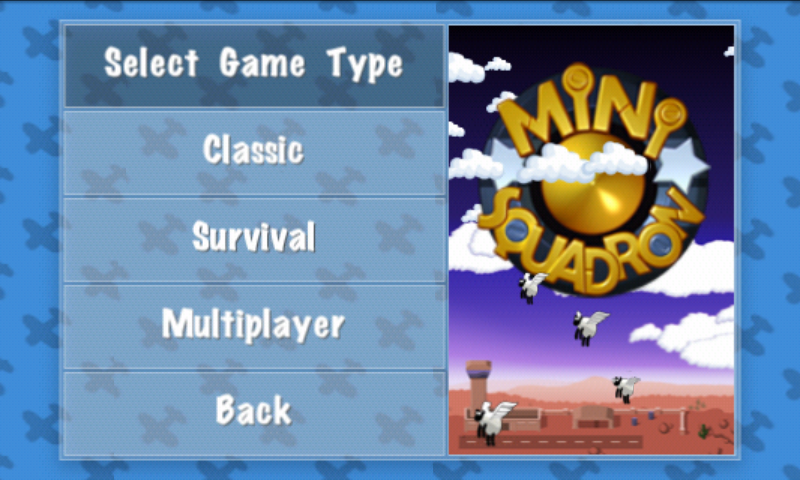 Unfortunately, MiniSquadron's controls are rather mediocre, if not a complete failure. Whereas this is a game where accelerometer-oriented controls would have been perfect, Supermono (the developer of the original iPhone game; Gray Fin Studios ported it over to Android) has seen fit to keep the controls entirely touch-based. Note from Artem: I think the controls are actually perfect - using the accelerometer would make it harder, more tiresome, and much more awkward to control. In the bottom left corner of the screen, you have a virtual joystick, which is normally as tiny as gaming controls get but which expands as soon as it is touched. I found this to be quite convenient, although the joystick itself was not always 100% accurate, and I sometimes found myself going downwards when I had intended to go up, left when my desire was to go right. A user error? Perhaps, but it happened more often in this game than in any other game I've tried, and therefore, I doubt it. Nay, I'm 99% sure this is a bug within the game, and it's certainly one that should be on the developer's list of things to address as soon as possible. Note from Artem: Haven't had anything like this happen on my EVO 4G - the controls are perfect. Strangely enough, the button used to shoot, which is also the one containing the cartoon explosion, was rendered in the bottom right corner on my EVO 4G (as seen in the screenshot above), but was rendered in the top right on my wife's Epic. It's certainly an interesting predicament, though not at all a pleasant one for users who are stuck with having the button in the top right, since I found it incredibly difficult to hit without activating the pause menu when the button was in that position. If nothing else, there should at least be a way to change this, but it's most likely a bug. Update: Gray Fin Studios has since reached out to me to let me know that this was necessitated since multi touch is an issue with some devices (that's you, Nexus One), and this was the only place they could put it so that it would function correctly on those devices. They also noted that it should have been rendered in the bottom left corner of my wife's Epic, but unfortunately, they can only detect the touch sensitivity accurately if the device is running Android 2.2 FroYo, which the Epic is not. Also, users of devices with trackballs can also use those to shoot as well. 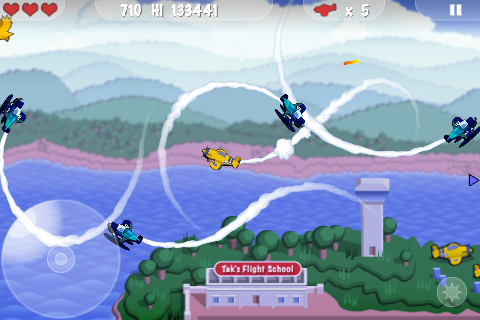 The game's basic premise is quite simple: shoot down as many of the fighter planes on the other team as you can without being shot down yourself. Once you dig in, however, you will find yourself up against a challenge as complicated as it is addictive. As I mentioned in the "Controls" section, the top left corner displays the amount of health you have left via a number of hearts. If the number of hearts you have remaining is three (which is how many hearts you have to begin with) or less, it will display exactly as shown above, with a visual indicator rather than the white digits that appear when the number of hearts is greater than three. While you have at least one heart, you will return to the place you left off before you died in the game. If you only had one heart before your death, however, you will be forced to return to the last checkpoint, which is often a few waves back. Inconvenient? Sure. Addictive? As hell. As you progress through the game, you unlock new levels, which, as you can see from the map above, are more like new countries. Occasionally, you will unlock more than one at a time, which presents players with the hardest choice in the world; it's like choosing between an EVO 4G and an Epic. Interestingly, not every wave gets harder, even though each country does; for example, in the very first country, you are presented with ducks first, then several planes that only shoot at you casually, then several more intense planes, and then, in wave seven, it's back to the ducks. Weird. 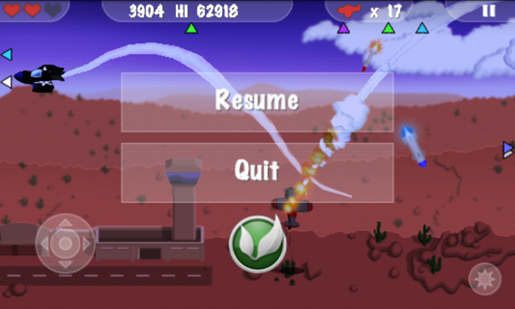 Regardless of the difficulty, the game includes checkpoints every three or so waves of incoming enemy planes. This helps since it often takes quite a while to reach a certain wave, and the last thing you want to do is have the game crash and lose your progress. Unfortunately, that is also the biggest limitation of the checkpoint system - the fact that it only saves your progress every few waves rather than each wave or even halfway through each wave. In the country to the right of the one that is locked in the screenshot above, the seventh wave is almost impossible to complete without losing at least two hearts, and there aren't any opportunities to gain them in between. Therefore, even if you finish it before the enemy planes finish you, you'll likely be left with only one heart, making the task of getting to the next checkpoint nearly impossible. And then there's that minor niggle I mentioned in the "Matters Of Life And Death" section above: dying brings you back to exactly the place you were before you died in the wave... unless you lose all your hearts, in which case you are forced to return to the last checkpoint. Perhaps, however, this is what makes the game so damn addictive. 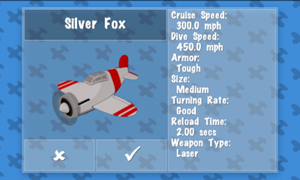 Being an aero combat game, one of MiniSquadron's main attractions is, of course, its weapons and planes, both of which are plentiful. Double cannons? Yup. Triple cannons? You bet! Laser guns? Homing missiles? MiniSquadron's got it all. 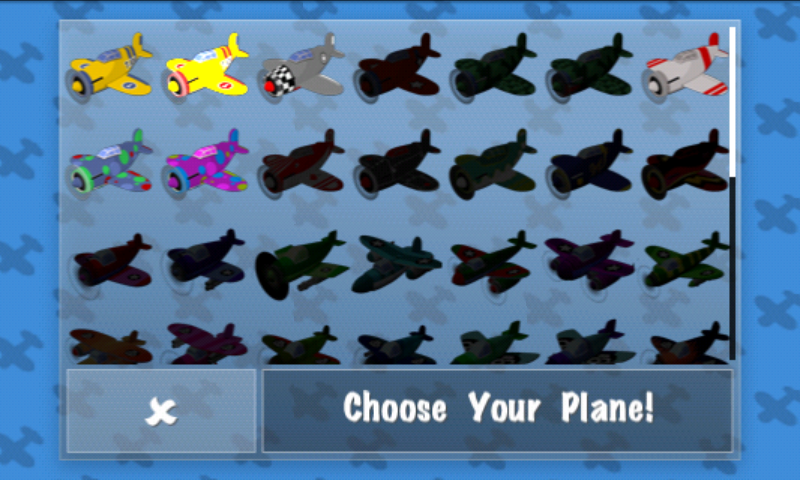 With a grand total of 56 planes (I have only been able to unlock seven so far), it would be hard to argue against the fact that the game's planes are as numerous as they are awesome, even if the enemy's planes often end up being even better, at least until you get to the more advanced countries and waves, in which you will unlock more advanced planes. One minor annoyance is the fact that although the planes come with great weapons, that's all you get. You can't keep a plane and change out its weapons, which would certainly have been a useful feature since certain planes are faster than others while simultaneously owning less powerful weapons. Definitely something I'd love to see in the app's next update. 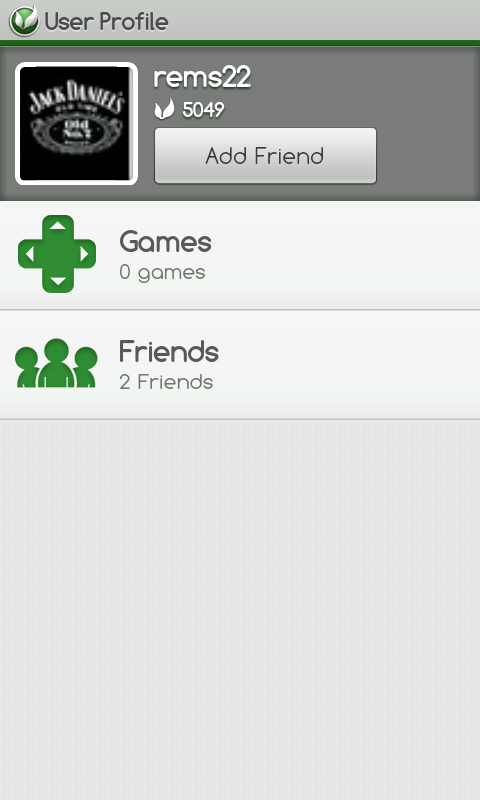 One of the game assets that intrigued me the most when I began my review was OpenFeint, a social gaming network that has been around for quite a while now on the iPhone before finally making the transition to Android about a week ago. The way it works is a bit confusing initially; rather than having an OpenFeint option accessible directly from the main menu that pops up when the game is first opened, the feature can be accessed exclusively via the in-game pause menu. 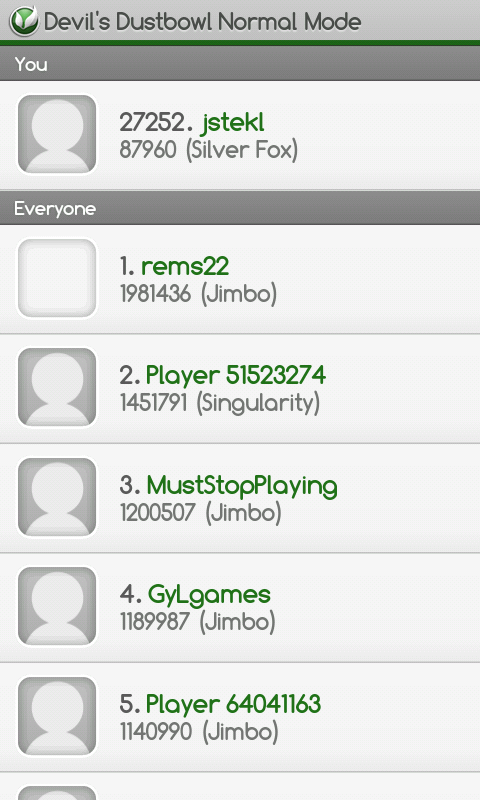 Additionally, the simple leaderboard that was opens upon a press of the OpenFeint button from the pause menu can easily fool users into thinking that is all there is to it; the other features, such as adding friends and viewing people's stats are accessed via a second press, this time upon the player's username. Nevertheless, OpenFeint is a nice feature to have, and becoming friends makes it much easier to stalk people (an activity many of us here at Android Police enjoy) as well as compete with them in the game. As an added bonus, players of the iOS version of the game will show up here as well. Survival mode in the game is pretty basic, offering pretty much exactly what I expected and nothing more; it's essentially the same thing as classic mode (which is what I've been talking about thus far in the review), only the waves are infinite (until, of course, you have no hearts left). In fact, you choose from the same countries, the same planes, the same everything. 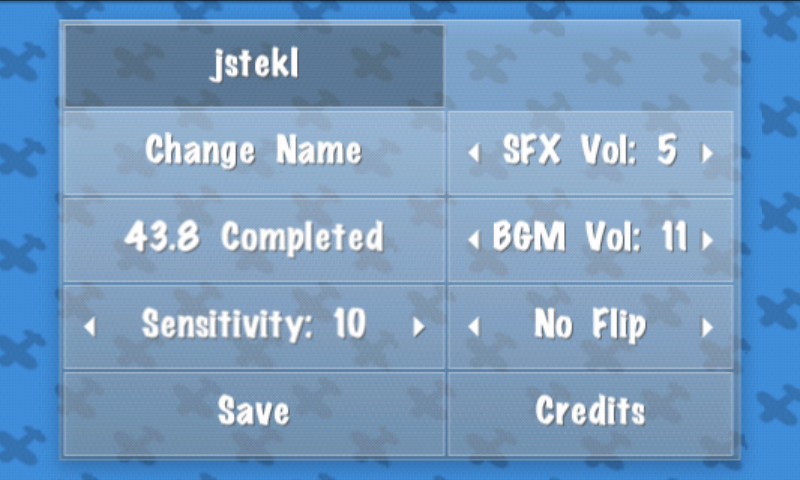 It's also worth noting that these items can only be unlocked in classic mode, at least from what I can see. The game also includes a multiplayer mode, which, unfortunately, is limited to WiFi (aka you can only play against people with devices on the same network as you) but which is just as addictive as classic mode, except for the fact that you get to play against your friends or loved ones (who momentarily become your mortal enemies). Just as with survival mode, you get the same selection of planes and countries as classic mode, only this time there are no waves at all, since it's just you and your opponent endlessly shooting at each other. Performance was actually way above that of what I expected initially, providing smooth frame rates and instantaneous updates as to who shot who. As far as pairing up with your iPhone-carrying buddies, I was unable to confirm whether the app was capable of this, though I don't see any technical reason as to why it wouldn't be possible. Update: It appears that this issue was caused by the fact that I was using Swype, which, apparently, isn't fully compatible with certain features of the game. While I certainly would have liked to see more options (the ability to delete existing parts of my OpenFeint username or creating my own soundtrack based off of music I have on my phone or perhaps changing the position of the joystick), it's far from a limited set of options - and hey, they're settings, how much more boring does it get? After all of this, I must say that I am quite pleased with MiniSquadron. It doesn't have all the features I'd like to see (adding weapons on to planes or having more settings would certainly make for a nice update), but overall, there's no arguing with the fact that this is one of the best and most addictive games in the Android Market. And, for $1.99 (usually $2.99, it's on sale until September 24), there isn't anything bad enough about it to stop me from recommending it. My advice? Go get it now!